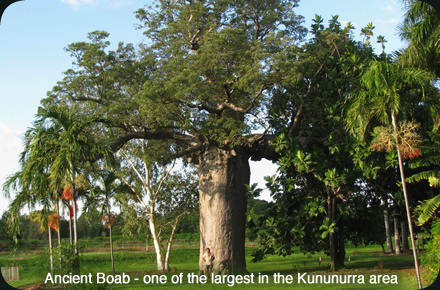 Unique to this magnificent part of Australia is the iconic boab tree – Adansonia gregorii. With its distinctive bulbous shape and network of stark leafless branches silhouetted against an azure sky, the Boab has become a symbol of the Kimberley Region. This ancient tree is found only in the Kimberley and western Victoria Region of the Northern Territory. There are eight species of Adansonia known in the world. Six are indigenous to Madagascar, with one native to mainland Africa and the Arabian Peninsula (Adansonia digitata) where they are known as the Baobab, and one in Australia – our Boab. These striking Kimberley trees, with stark leafless branches during the ‘dry’ and festooned with brilliant green during the ‘wet’, attract attention because of their diverse and unusual shapes. They are very individual and have a spiritual presence about them. It is no surprise that the Boab is regarded as a special tree by Kimberley Aborigines. For further information on the Geographical Distribution of the Boab and The Boab and the Australian Aborigines, please click on the following links. Help, I was wondering if there is anywhere in kunanurra where I might be able to buy some boab seedlings while we are in the area. We live in Hervey Bay in Qld and would love to plant a couple of bombs in what we call our bush garden.